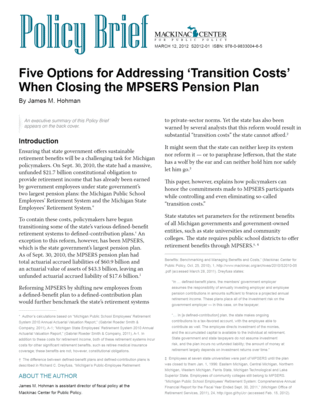 The preceding discussion shows there are several avenues for reforming MPSERS while minimizing or eliminating near-term “transition costs.” Each has costs and benefits, and it is important not to blow the costs out of proportion or to ignore the benefits. Take the question of “transition costs.” The papers on this issue by the SFA, HFA and ORS analyze the near-term impact of a defined-contribution reform on both the normal cost and unfunded liability payments. The papers do not consider, however, a very real risk: the possibility that unfunded liabilities will become burdensome to present and future generations in a defined-benefit system. Recent history indicates just how much unfunded liabilities can increase: From fiscal 2009 to fiscal 2010 in the MPSERS defined-benefit plan, the unfunded liability grew from $12.0 billion to $17.6 billion. Some of this increase, of course, was due to an early retirement incentive, but at the very least, the unfunded liability due to the nature of the defined-benefit plan was $16.3 billion. This $4.3 billion increase in a single year was equivalent to a tenth of the annual state budget and more than half of the fiscal 2010 general fund. In fact, since fiscal 2000, the unfunded liability of MPSERS defined-benefit has leapt more than 6,500 percent from a relatively “modest” $246 million. In that same period, the state has failed to make the ARC eight times (see Graphic 3), despite increasing the employee and employer contributions to the plan. All of these costs have hit the state during a time when its economy has been depressed and taxpayers’ personal finances have been stressed. 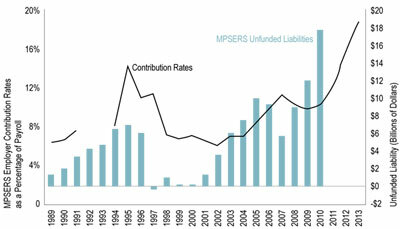 MPSERS employer contribution rates for the defined-benefit pension plan have risen drastically along with the unfunded liabilities, as Graphic 4 shows. Source: Kerrie Vanden Bosch, email correspondence with Hohman, Sept. 2, 2011; “Michigan Public School Employees’ Retirement System: Comprehensive Annual Financial Report for the Fiscal Year Ended Sept. 30, 2011,” (Michigan Office of Retirement Services, 2011), 46, http://goo.gl/hyUcr (accessed Feb. 15, 2012); “Michigan Public School Employees’ Retirement System: Comprehensive Annual Financial Report for the Fiscal Year Ended Sept. 30, 2000,” (Michigan Office of Retirement Services, 2000), 31, http://goo.gl/LzHpV (accessed Feb. 15, 2012); “Michigan Public School Employees’ Retirement System: Comprehensive Annual Financial Report for the Fiscal Year Ended Sept. 30, 1997,” (Michigan Office of Retirement Services, 1997), 29, http://goo.gl/9kjvI (accessed Feb. 15, 2012). Note: The Department of Management & Budget letters for MPSERS employer contribution rates in fiscal 1992 and fiscal 1993 are unavailable from the Office of Retirement Services. Unfunded liabilities for the MPSERS defined-benefit plan are not available for fiscal 2011, fiscal 2012 and fiscal 2013. Contributions for MPSERS OPEB are excluded from the data. In comparison, during this same period, the MSERS defined-contribution plan has accrued no unfunded liability. The required contributions have been made every year, and the employer contribution rates have remained all but unchanged. Indeed, the MSERS defined-contribution plan has been current, predictable and affordable. And unlike the MPSERS defined-benefit plan, the MSERS defined-contribution plan has clearly satisfied the requirements of the Michigan Constitution, having financed all benefits in the year they were earned. In effect, the MSERS defined-contribution plan has been the mirror opposite of the MPSERS defined-benefit plan. The defined-contribution plan also provides an element of control missing in the defined-benefit plan. The Legislature can halt any employer payments to a defined-contribution plan when cash is tight without generating new, long-term claims on taxpayers. At the same time, note that during Michigan’s decade-long recession, the Legislature has never once reduced contributions to the MSERS defined-contribution plan. In fact, a defined-contribution program can allow generous contributions on the upper end. A 401(k) plan, for instance, allows a maximum of $17,000 of annual tax-deferred contributions, regardless of whether it is from an employer or employee, though these restrictions are loosened as employees approach retirement age. Given that the average salary of a school employee is $63,024, a maximum employer contribution would represent 27 percent of pay. [*] Note, too, that such generosity would not need to affect decisions about the plan in future years. In contrast, the Legislature often provides generous increases in benefits that have ramifications for years to come. For instance, with MSERS defined-benefit plan, the Legislature bumped cost-of-living benefits for retirees 6 times in the 16-year period between 1972 and 1987. The effects of those decisions are still being felt in the MSERS plan, even in fiscal 2010, when the MSERS defined-benefit plan recorded a $4.1 billion unfunded liability. Similarly, the state has generally assumed that MPSERS’ defined-benefit plan investments will achieve an 8 percent return. [†] But as mentioned above under “Normal Cost,” MPSERS’ defined-benefit portfolio realized an approximately 5.4 percent annual rate of return from the end of fiscal 1997 to the end of fiscal 2011. The gap between state investment performance and its estimations adds to its unfunded liabilities while reducing the plan’s apparent normal cost. The volatile nature of defined-benefit pension expenses is borne by taxpayers. The cost of these plans depends on numerous uncertainties: the life-length of retirees and beneficiaries, how long employees will work before retiring and employees’ final salaries, among other continually changing assumptions. Shifting contribution rates are a risk to state employers and ultimately taxpayers. Closing the MPSERS defined-benefit plan reduces this risk. Even if that closure prevents the state from backloading its pension contributions, the larger fiscal danger lies in developing unfunded liabilities in the first place and in the number of actions that the state can take to exacerbate that problem, such as failing to make the annual required contribution. [*] Moreover, employers can offer any other sort of additional contributions for retirement provided that it is treated as normal income for tax purposes. [†] As mentioned in the first footnote in "Normal Cost," statutory reforms in 2010 required that assets set aside for MPSERS Pension Plus members be discounted at 7.0 percent, rather than the traditional 8.0 percent. “Public Act 75 of 2010,”), Sec. 41(11), http://www.legislature.mi.gov/documents/2009-2010 /publicact/pdf/2010-PA-0075.pdf (accessed Aug. 3, 2010).